This lithograph is taken from plate 25 of 'General Views of Lucknow' by Sir DS Dodgson. Erected in 1780, this was the first proper bridge to cross the river Gomti at Lucknow. It was begun by Safdar Jang, Nawab of Avadh (1739-53), but was not completed until the reign of his grandson, Nawab Asaf-ud-daulah, which coincided with the peak of Avadh's prosperity and fame. Like most of Lucknow's Nawabi buildings, the building was made of brick and covered with chunam, a form of polished stucco made from burnt seashells. It was condemned as unsafe in 1911 and demolished by the British to make way for the Hardinge Bridge. 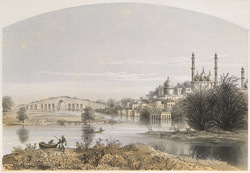 The old stone bridge played a strategic role during the Indian rebel uprising of 1857. With the Governor's Residency under siege, Captain Kavanagh made a perilous journey beyond its walls to guide Colin Campbell's relieving force into Lucknow. Kavanagh swam across the river and re-entered the city over the stone bridge, narrowly escaping death.